Just sharing what I’ve recently discovered when I set my mind to learn what I’ve missed out on WordPress. John&Jacq~s Garden website had been initially set up by our elder son, David, using WordPress as our blogging tool and publishing platform. Thus, I’m not as familiar with the technical aspect of it (especially the template, etc.) as I do with Blogger, the other publishing platform that I use for my other blogs. Ever since it was first set up in September 2006, I have been focusing on just presenting as many articles as I possibly could and getting them properly categorized. I’ve never bothered to learn about the layouts of the site or how to improve its appearance as a whole….that’s too technical, I thought? It was only recently when our boy upgraded our version of WordPress to version 2.8.4 that finally aroused my curiosity and interest. It’s new layouts and features are awesome, enticing me to explore and learn. I’m so happy that by clicking on all the links therein in earnest, I came across one that is most crucial to guide me through, that is, the WordPress Codex. Gosh, I did not know that this powerful and ultimate WordPress reference exists for its users! What a great and valuable resource! As I probe further into WordPress Codex, I’m truly humbled…there’s so much to learn, discover and grasp. A steep learning curve, it will be obviously! Learning online can be quite tiresome, especially when you’re up against a wall with questions that have no answers. Undoubtedly, a physical tutor beside me would simplify matters and make a world of difference, but beggars cannot be choosers, right? That’s why, I’m recording here what I’ve discovered and applied thus far, lest my memory fail me later should I need to replicate them if ever I change our site’s template design/theme or for whatsoever reason. Who knows, maybe someone may be facing the same WordPress dilemma and get some insights here! I’ve registered as a member at Botanical recently, and wanted to include its logo to this site’s right sidebar but just didn’t know how-to. This was my first challenge at tweaking the theme file that succeeded after many failed attempts and rereading over and over the WordPress Codex documentation. Scroll down the codes to locate the position where you’d want to insert your logo. I wanted it placed after the ‘Recent Posts’, so it will be inserted below the code, <?php get_links_list(); ?>. But, before editing the theme file, you may want to copy and paste it onto a Notepad or TextEdit, just in case it’s unsuccessful and you need to revert to it again. Click Update File, when done. Then, click View Site, to see the addition. Previously I had this banner at the end of every post as I didn’t know how-to have it appear at the site’s sidebar. Now, I’ve every reason to smile, as it’s where I wished it to be. The process is quite similar to inserting the Blotanical logo. (Note: I’ve added the text, target=”_blank” so that the link opens in a new window. Also, many of the HTML attributes in capital letters that showed as errors by the W3C Markup Validation Service, were corrected to lowercase letters. When done, click Update File, to save edit. Go on, you can choose your own banner for your site/blog at Copyscape’s gallery of banners if you’re interested. These were features that I had yearned for so long! Gosh, these were tough nuts to crack…almost had migraine trying them! After much effort, I had to post a query to WordPress Support to help solve the riddle. Insert the following <p><?php the_tags(); ?></p> below the text <?php the_content() ;?> , bearing in mind that a template tag should be placed before this point <?php endwhile; ?> as indicated at WordPress Codex – The loop in action (this was the missing clue that solved the riddle for me!). Click Update File when done. Have noticed this feature at the right sidebar but never bothered to explore! Just recently discovered that it is a tool from W3C Markup Validation Service) to check the markup validity of Web documents in HTML, XHTML, etc. Just click on its button to validate your web page. Whew…so many HTML errors were found in most of our web documents by this Validator! If only I hadn’t ignored this feature much earlier, I wouldn’t be wasting precious time now cleaning up the mess. Aaargh!! I’ve only managed to tidy up only about 10% of our published posts so far. What a boring job and quite time-consuming, but rather challenging and exciting when all errors in each document are removed and validated. Anyway, I’m resolved to continue this validation process, targeting probably 5 web pages per day, until our site is fully valid, no matter how long that takes. Just discovered how to sign off each post with a personalized signature. Read about how-to create your own signature at Jacqsbloggertips, if you’re interested. Once, you’ve obtained the HTML code of your personalized signature at MyLiveSignature.com, return here to know how-to add your signature to all your WordPress posts (the past, present and future) automatically. Jacqueline, thanks for sharing all tips. 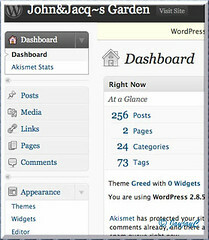 I’m using wordpress to run my blog. Have just got my signature on my blog but was not aware that I can add the code so that it appears on every blog post. I’ll check that out. Congratulations Jacqui, you are good with these computer language! I envy you very much just like Autumn Belle. In my case i cannot even follow her instruction of putting her site in the link. So i just dropped the intention, at least i can do the link within the posted item body of the article. That can be enough for me at this point. Learning computer instructions is not one of my better traits! I am not patient on it also, so, just accept the least. hehe. MaryMoh – you’re most welcome. I enjoy learning and just love sharing, and if someone benefits from it, it truly gladdens my heart. Hope you’ve succeeded getting your signatures automatically done this preferred way. Andrea – thanks, dear. Frankly, I just know enough to get by, but encountering lots of hiccups along the way. Fortunately, I’m blessed with a thirst for learning and a persevering nature to improve/excel. Somehow, I get the feel that you too will eventually succumb to wanting to learn further since you do maintain your own blog, right? All the best to you. Jacqueline, wordpress looks difficult to me. In you opinion, which is more user friendly and which has more features? Frankly, Autumn Belle, both Blogger and WordPress are awesome in their own rights, it’s just us users that are limited in our knowledge, imagination or desire to master it. If we started out with Blogger before WordPress, then of course, we become seasoned with using it and would say that Blogger is easier than WordPress. Hence, WordPress appears more difficult for me at the moment as I’m just starting out to probe further into its many available features, and thus would seem less user friendly. On the other hand, though Blogger’s new layout features are fairly new to me too, but I find it easier as I’ve already overcome the many obstacles encountered as I continue teaching a friend to blog. Anything new always appears difficult initially. Cheers and have a lovely weekend!